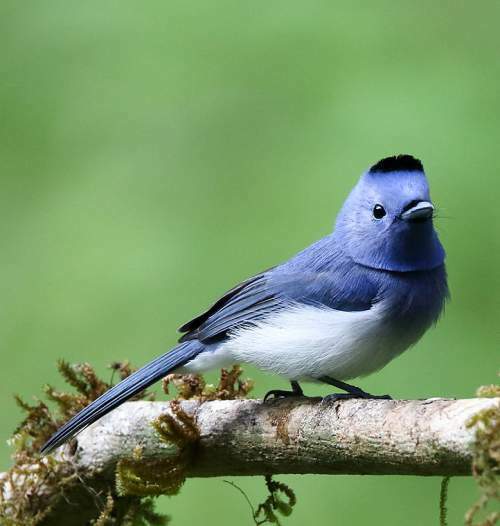 The black-naped monarch (Hypothymis azurea), also known as black-naped blue flycatcher, belongs to the family of monarch flycatchers, the Monarchidae. The monarch species is distributed in Indian subcontinent, southeast Asia, Taiwan and China. These monarch species are insectivorous, often hunting by flycatching. These monarch species are polytypic species. The black-naped monarch (Hypothymis azurea) is a small monarch, measuring 15 to 17 cm in length and weighing 9 to 13 grams. These species are sexually dimorphic. The black-naped monarch male has pale azure blue head, face, upperparts, wings, throat and breast. There is a blackish patch on the nape and a blackish half collar at the throat. The forehead and chin have a small blackish patch near the bill. The gape is surrounded by rows of long rictal bristles. The belly and vent region are white. The tail is long and the undertail is grayish. The female has grayish blue head and grayish brown upperparts. The throat and breast are grayish and the underparts are whitish. The bill is blue in male and gray in female. The irises are dark brown. The feet are bluish gray in males and gray in female. The call of these monarch species is a sharp, clear ringing "we-we-we-we" sound. These black-naped monarch species are distributed in India, Nepal, Bhutan, Bangladesh, Sri Lanka (H. a. ceylonensis), Myanmar, Thailand, Cambodia, Laos, Vietnam, Malaysia, Singapore, Brunei, Indonesia, Philippines, Taiwan (H. a. oberholseri) and China. In India, these monarch species are distributed in most of the states except arid regions of Rajasthan, Jammu and Kashmir and Himachal Pradesh. These species also occur in Andaman (H. a. tytleri) and Nicobar (H. a. idiochroa and H. a. nicobarica) Islands. 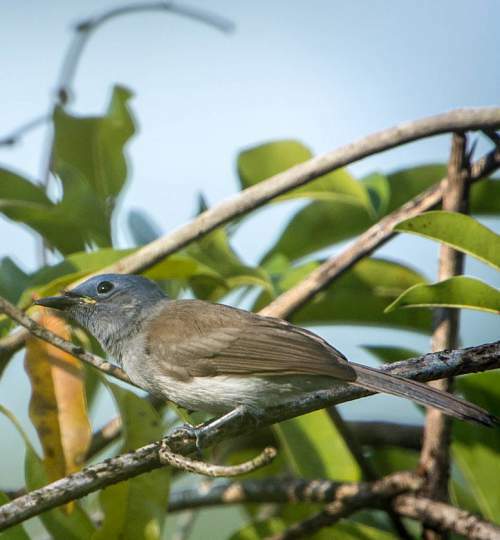 These black-naped monarch species have moderate forest dependence. They normally occur in altitudes from 0 to 1500 meters. The artificial ecosystems and habitats of these species include heavily degraded forests and plantations. The natural ecosystems and habitats of these monarch species include tropical and subtropical dry forests, broadleaf evergreen forests, tropical and subtropical moist lowland forests, mangrove forests, riverine forests, rivers and streams. 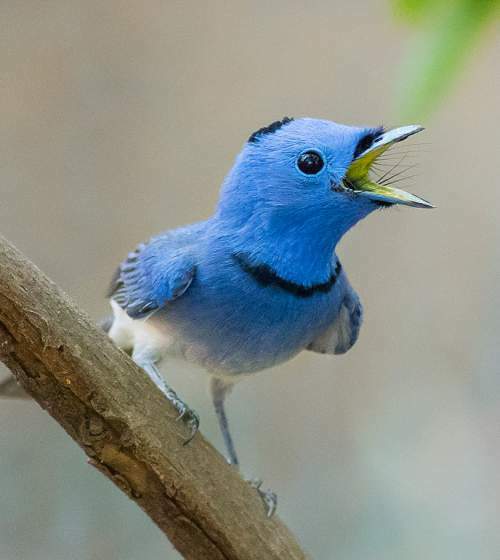 The diet of these black-naped monarch species consists mainly of insects. Flying insects, grasshoppers, moths, beetles, flying termites and ants, wasps and bees are their primary food. They hawk flying insects. The breeding season of these black-naped monarch species is from March to September in India. The laying season is from March to August in southeast Asia. The breeding season is from April to July in Taiwan. These monarch species are monogamous and territorial. The nesting site is usually a fork of a tree branch. The nest is a compact conical structure made with grass, twigs and rootlets and bound with spiderweb. The nest is covered with cobwebs and spider egg cases. The clutch normally contains three eggs. Both the parents incubate the eggs and feed the young. The chicks hatch out after 12 days. The chicks produce faecal sacs and the parents collect and dispose them off. These black-naped monarch species are non-migrant resident birds. The populations in higher altitudes descent to lower levels during winter. The global population size of the black-naped monarch (Hypothymis azurea) has not been quantified. The overall population trend of the species is considered to be stable. In most of its range, this species is reported to be widespread and common. The generation length is 4.2 years. Its distribution size is about 19,800,000 sq.km. Habitat alteration and destruction, loss of insect populations due pesticide use, deforestation are the main threats that are endangering the survival of these monarch species. The black-naped monarch (Hypothymis azurea) does not approach the thresholds for being Vulnerable, either under the range size criterion, or under the population trend criterion or under the population size criterion. The CITES (Convention on International Trade in Endangered Species of Wild Fauna and Flora) status is ‘Not Evaluated’ for the black-naped monarch (Hypothymis azurea). The black-naped monarch (Hypothymis azurea) is closely related to the pale-blue monarch (Hypothymis puella). There are twenty three recognized subspecies of black-naped monarch. Current topic in : Black-naped monarch - Hypothymis azurea.